Another spectacular shot of Mt. Hood taken from the Fanning, Oregon. Just another example of how photogenic Mt. Hood is when you have a stunning blue sky in the background and snow covered trees in the foreground. 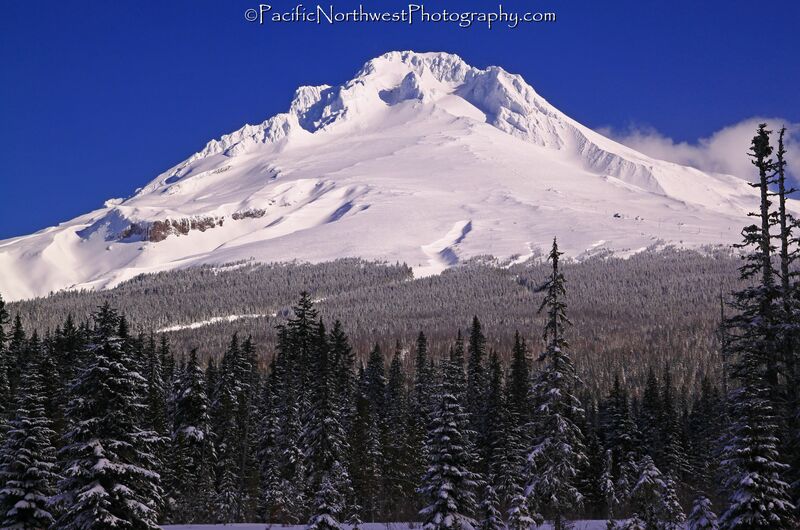 It also helps when the mountain is completely white and resembles a giant vanilla snow cone. This photo pretty much sums up that if you want to enjoy an epic snow journey, you only have to drive about 1 hour from downtown Portland, Oregon. However, the best kept secret is to visit one day after a massive snow storm blankets the Cascades and then check the weather and see if Government Camp is expecting sunny skies. Since the forested trees sometimes have a difficult time holding up the weight of the snow, you have to be pretty quick or you may have some spotty snow covered trees. I usually try to get up as early as possible in order to avoid the afternoon sun or the rising of the temperatures. However, even if you can’t get up at the best possible time you are still going to have a great time skiing, snow-boarding, snow-shoeing, cross country skiing, sledding or any other winter activity that you enjoy. Either way, Government Camp is a great place to visit and it’s especially magical during the winter months.